Trillions of bacteria are currently living in our gut in a peaceful relationship with our body. Gut microbiome reveals its secrets little by little. Research found that gut bacteria contribute to keep us healthy. Why is gut microbiome worth of interest? The gut microbiome or gut microbiota is the ecosystem living in our gut. It is estimated that our gut hosts trillions of microorganisms, which are from about 1000 different species. These microorganisms belong to three domains of life: Microbes, Fungi and Archea. Because of this diversity, these bacteria genes, taken together, add up to more genes than the human host. The set of all microorganisms’ genes is the gut microbiome. The remarkable feature of gut microbiota is the way it dialogues with our body. Actually, the bacteria genes interact with the human host thanks to cell receptors (located in epithelial, neural or immune cells), hormones and metabolites. As for now, available evidences have shown that gut microbiota can influence metabolism and the way our metabolism is modified can be beneficial or detrimental, the impact of the microorganisms on gut will depend on their identity and abundance. There are probably still many things left to discover on the gut microbiota as research only started to explore this subject few years ago. The way gut microbiota influence our metabolism is still under study. However, some data are already available and proven. How do gut microbiota impact health and diseases? All these examples highlight the tremendous potential of the human microbiome in both medicine and science. There are probably unknown functions that research will find soon or later. On the other hand, research suggests that microbial disbalance, or dysbiosis of the gut microbiota could trigger diseases. There is growing evidence that dysbiosis of the gut is linked to pathogenesis of intestinal disorders and extra-intestinal disorders. Intestinal disorders include inflammatory bowel disease, irritable bowel syndrome (IBS) and coeliac disease, whereas extra-intestinal disorders refer to diseases such as cardiovascular diseases, metabolic syndrome, obesity, asthma and allergy. For instance, some patients suffering from type 2 diabetes have disruptions in the composition and function of their gut microbiota. This observation is in favour of a microbe-mediated development of disease. Could we treat diseases through improving gut microbiota? Gut microbiota is currently studied for its therapeutic potential in treating obesity and associated metabolic diseases. Indeed, studies have shown that obesity and associated metabolic diseases, such as Type 2 diabetes, are strongly linked with diet. The impact of diet on obesity is commonly agreed. Still, because gut microbiota may reflect both diet and metabolic health, it has become a major topic for research. A body of knowledge presents the gut microbiota as a mediator of dietary impact on the host metabolism. Gut microbiota are also believed to intervene in our mood and well-being. Research reveals that our gut can affect emotional health. Some researchers now focus on understanding how our gut can impact emotional health. This relationship can be modified by the intake of probiotics. Probiotics are believed to shape emotions, sensations and even lower anxiety and depression. This rely on the hypothesis that, through communication between gut microbiota and our brain, probiotics could affect some specific brain activities. When the intestinal barrier is damaged, various neurotransmitters produced by bacteria themselves can cross this barrier and travel to the brain. What are the main influence factors of gut microbiota? Besides being unique, gut microbiota evolves through our lifetime. Age, diet, stress, environment, health status, medication exposure (such as the intake of antibiotics) and geography shape our gut microbiota. It is worth mentioning that what we eat may have the greatest impact on gut microbiota and this is something we can pretty much control. A balanced diet combined with a healthy lifestyle is probably the best way to contribute to gut health, and also to correct dysbiosis. Since food interacts with our microbial tenants, having a look at our eating habits is a way to modulate our microbiota and therefore to improve our health. Dietary patterns and specific nutrients affect significantly the microbial composition. There is growing evidence that high-fat diets contribute to intestinal dysbiosis, which can lead to a reduced gut permeability. This loss of permeability triggers immune cells which foster inflammation. Besides, research also underlines the importance of fibers, because low-fiber diets may influence gut microbiota in a way that may have indirectly negative effects on health. What are the types of food may contribute to gut health? fermented milk such as yogurt : they deliver many living lactic acid bacteria to the digestive tract. Once they reach the gut, these bacteria sustain the living microbes crossing the gut, at least in a short term. According to researchers, lactic acid bacteria may modulate the intestinal environment, enhance gut permeability and reduce potentially harmful enzymes produced by other bacteria. fermented foods such as kombucha, kimchi and sauerkraut : they bring replenishment for good gut bacteria. healthy fats such as olives, fatty fish (salmon for instance), butter, coconut oil : they reduce inflammation, which can occur with a leaky gut for example. Because of the growing understanding on how diet, microbiota and health are linked , the intake of both probiotics and prebiotics attract a lot of attention. Can probiotics improve gut health? prebiotics as “selectively fermented ingredients that allow specific changes, both in the composition and/or activity in the gastrointestinal microflora that confers benefits upon host well-being and health”. More and more studies depict the relationship between probiotics and gut health. The main interest of probiotics is that they provide a way to deliver beneficial bacteria directly to the gut. Medical research is currently evaluating probiotics and prebiotics as potential non-invasive treatments to ease gut disorders. Let’s focus on yogurt and its probiotics. 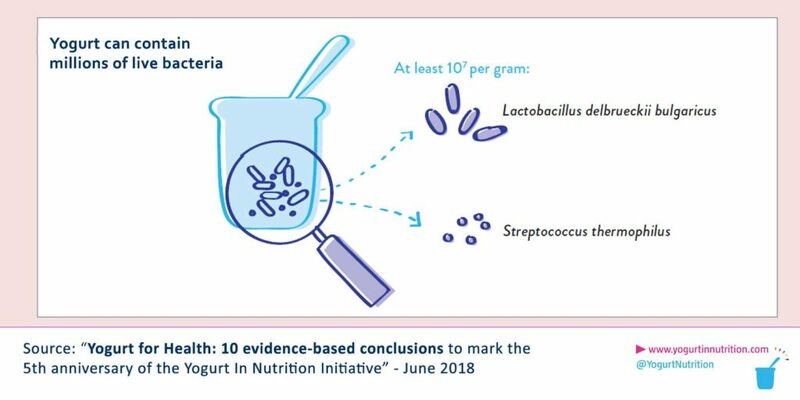 Apart from key nutrients, yogurt also contains living microorganisms, such as Lactobacillus and Bifidobacterium, that positively influence gut disorders . The dairy matrix also matters, since it promotes the action of most probiotics. The living organisms of the yogurt alleviate disorders such as IBS, allergic disease, infectious diarrhoea and necrotizing enterocolitis. Then, yogurt consumption has been associated with a better health, in particular it has been linked with reduced risks of type 2 diabetes, heart disease, metabolic syndrome and with a better weight management. Thus, research has proven that preserving the balance of gut microbiota is key to remain in a good health. This is why having a healthy diet is particularly important. Probiotics and fermented foods are under study to determine their potential to positively impact the gut microbiota and to prevent dysbiosis and gut dysfunction. Current research aims at establishing causal relationships between diet, gut microbiota and health. It also aims at assessing the possibility to target and modulate gut microbiota for therapeutic interventions.